Aplastic anemia (AA) is characterized by pancytopenia and bone marrow hypoplasia, which results from immune-mediated hematopoiesis suppression. Understanding the pathophysiology of the immune system, particularly T cells immunity, has led to improved AA treatment over the past decades. However, primary and secondary failure after immunosuppressive therapy is frequent. Thus, knowledge of the immune mechanisms leading to AA is crucial to fundamentally understand the disease. To elucidate the T cell receptor (TCR) signal transduction features in AA, the expression levels of CD3γ, δ, ε and ζ chain and FcεRIγ genes, which are involved in TCR signal transduction, and the negative correlation of the expression levels between the CD3ζ and FcεRIγ genes in T cells from peripheral blood mononuclear cells (PBMCs) were analyzed. Real-time RT-PCR using the SYBR Green method was used to detect the expression level of these genes in PBMCs from 18 patients with AA and 14 healthy individuals. The β2microglobulin gene (β2M) was used as an endogenous reference. 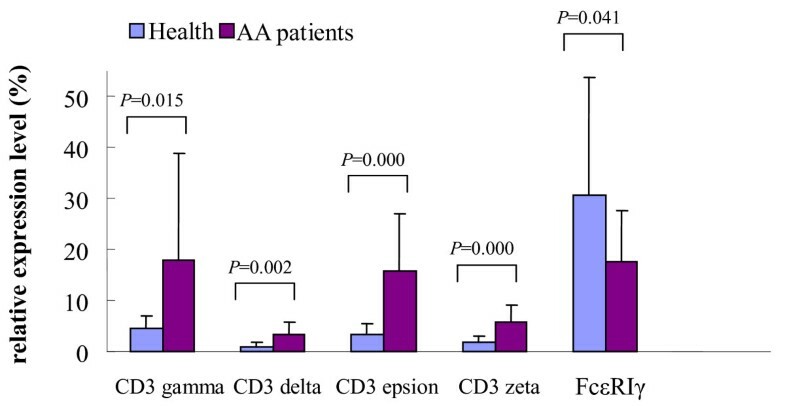 The expression levels of the CD3γ, CD3δ, CD3ε and CD3ζ genes in patients with AA were significantly increased compared to a healthy control group, whereas the FcεRIγ gene expression level was significantly decreased in patients with AA in comparison with the healthy control group. Moreover, the negative correlation of the expression levels between the CD3ζ and FcεRIγ genes was lost. To our knowledge, this is the first report of the CD3γ, CD3δ, CD3ε, CD3ζ and FcεRIγ gene expression in patients with AA. The abnormally expressed TCR signaling related genes may relate to T cells dysfunction in AA. Aplastic anemia (AA) is a potentially fatal bone marrow failure disorder that is characterized by pancytopenia and bone marrow hypoplasia. In most cases, AA behaves as an immune-mediated disease . Immunosuppression is a key treatment strategy for patients who are not suitable bone marrow transplant (BMT) candidates due to age or the lack of a suitable donor. Immunosuppression with antithymocyte globulins and cyclosporine is effective for restoring blood cell production in the majority of patients [2, 3]. The thought that T cells play a major role in the pathophysiology of AA became evident in the late 1970s with the finding that marrow and peripheral blood lymphocytes from patients with AA were able to suppress hematopoiesis in vitro. Subsequently, activated CD8+ T cells were identified as the lymphocyte subset that inhibited hematopoiesis in AA patients . Further studies have indicated that the mechanism includes Fas-induced apoptosis  and the release of several inhibitory cytokines including γ-interferon (IFN-γ), tumor necrosis factor-α (TNF-α) and transforming growth factor-β (TGF-β) [6–8]. Subsequent studies have demonstrated that oligoclonal expanded cytotoxic T cells target hematopoietic stem and progenitor cells . All of these findings suggest that the molecular basis of the aberrant immune response and deficiencies in hematopoietic cells is T cells activation pathway dysregulation . When T cells encounter antigens via the TCR, information about the quantity and quality of antigen engagement is relayed to the intracellular signal transduction machinery. The TCR lacks a significant intracellular domain. Instead, it associates with CD3 molecules, which contain intracellular signaling domains that couple the TCR/CD3 complex to downstream signaling machinery. The earliest TCR signaling events involve the transfer of information from the antigen-binding TCR subunit to the CD3 signaling subunits in the TCR/CD3 complex . The Fc epsion receptor type Iγ (FcεRIγ) chain is a member of the CD3ζ chain protein family, and it is a component of the high-affinity IgE receptor FcεRI. There is evidence that the FcεRIγ chain can replace a functionally deficient CD3ζ chain and facilitate TCR/CD3 complex-mediated signaling [11, 12]. Growing evidence has shown that AA is a type of autoimmune disease that involves a T cell attack against hematopoietic progenitor cells . Oligoclonal T cells expansion was detected in autoimmune diseases such as systemic lupus erythematosus (SLE), rheumatoid arthritis and multiple sclerosis [14–17]. The TCR/CD3 signaling complex appears to be down-regulated by mutations/polymorphisms in autoimmune diseases, chronic inflammation and malignant tumors, which are thought to be related to T cells immunodeficiency [18, 19]. Antigen-specific T cells play a central role in immune and inflammatory responses. An appropriate immune response by these cells depends on the careful regulation of their activation. However, little is known about the expression pattern of the CD3 complex and FcεRIγ genes in AA patients. We concluded that analysis of these genes in AA patients during their initial presentation may serve to identify the abnormal immune characteristics of AA. The AA group consisted of 18 patients with newly diagnosed AA (12 males and 6 females; median age: 21 years, range: 8-73 years). Two of the cases were collected after immunosuppression treatment (ATG + CsA) at different time points (i.e., 1, 3 or 4 months). The information and clinical data of patients were described in Table 1 and 2. Fourteen healthy individuals (9 males and 5 females; median age: 24.5 years, range: 12-65 years) served as the control group. The AA diagnosis was established by bone marrow biopsy and peripheral blood counts. All of the procedures were performed according to the guidelines of the Medical Ethics committee of the health bureau of the Guangdong Province of China. Peripheral blood mononuclear cell (PBMC) isolation, RNA extraction and cDNA synthesis were performed according to the manufacturer's instructions. Real-time PCR using the SYBR Green I method was used to examine the CD3γ, δ, ε, ζ and FcεRIγ gene expression levels using cDNA obtained from the PBMCs of the 18 patients. The primer sequences and PCR conditions have been previously described . Briefly, the PCR reactions were performed in a total volume of 25 μl containing approximately 1 μl cDNA, 0.5 μM of each primer pair, and 11.25 μl 2.5 × RealMasterMix (Tiangen, Beijing). After an initial denaturation at 95°C for 2 min, 45 cycles consisting of the following procedure was performed using an MJ Research DNA Engine Opticon 2 PCR cycler (BIO-RAD, Hercules, CA, USA): 15 s at 95°C; 1 min at 58.9°C for β2M and CD3γ, 60°C for CD3ζ and FcεRIγ, 60.8°C for CD3δ, and 62°C for CD3ε; and 1 s at 82°C for plate reading. The 2(-ΔCT) method was used to analyze the results of the genes of interest relative to an internal control gene . An independent-samples t test was performed to compare the mean of each gene expression level between the patients with AA and the control groups. Pearson correlation and linear regression analyses were used to estimate the correlation between the CD3ζ and FcεRIγ gene expression levels from the different groups. A P < 0.05 was considered statistically significant. The gene expression levels of CD3γ, CD3δ, CD3ε, CD3ζ and FcεRIγ in cDNA obtained from the PBMCs of 18 patients with AA before treatment and 14 healthy individuals were quantitatively assessed by real-time PCR using the SYBR Green I method. All five genes were detected in every sample. Significantly higher expression levels of CD3γ (17.84 ± 20.97, p = 0.015), CD3δ (3.24 ± 2.61, p = 0.002), CD3ε (15.73 ± 11.44, p = 0.000), and CD3ζ (5.65 ± 3.51, p = 0.000) were observed in patients with AA compared to the healthy controls (CD3γ (4.43 ± 2.67), CD3δ (1.02 ± 0.69), CD3ε (3.36 ± 2.09), and CD3ζ (1.83 ± 1.21) for the healthy controls; Figure 1). In contrast, significantly lower FcεRIγ expression levels (17.63 ± 9.95) were found in the AA group compared to the healthy group (30.55 ± 23.21, p = 0.041). The relative gene expression levels of CD3γ, CD3δ, CD3ε, CD3ζ and FcεRIγ in PBMCs from the AA and healthy groups. The expression level of all five genes was compared in two patients with AA before and after treatment. 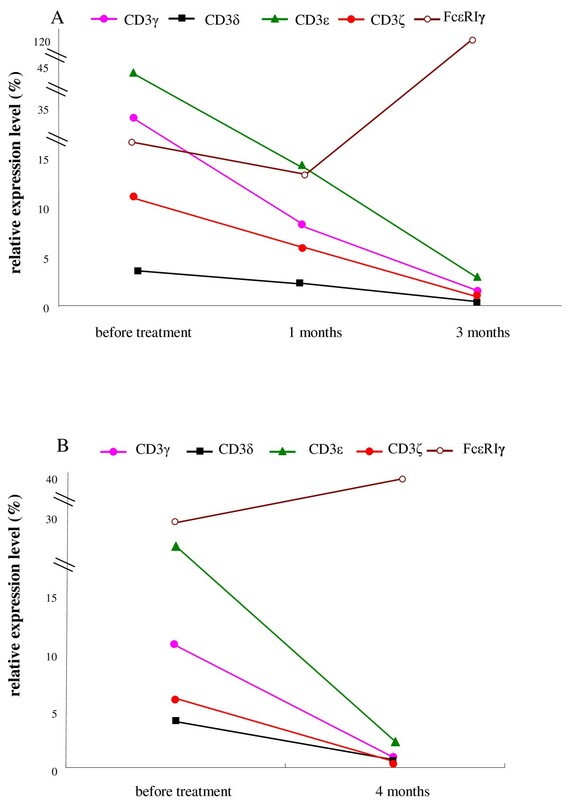 The expression levels of the CD3γ, CD3δ, CD3ε and CD3ζ genes decreased, and the FcεRIγ expression level of increased after treatment (Figure 2A, B). The CD3γ expression level decreased from 34.03 to 1.31, the CD3δ expression level decreased from 3.36 to 0.52, the CD3ε expression level decreased from 45.06 to 2.96, the CD3ζ expression level decreased from 10.96 to 0.86, and the FcεRIγ expression level increased from 5.97 to 107.55 in the 3 months after treatment in 1 case (Figure 2A). The expression levels of CD3δ, CD3ε and CD3ζ returned to the normal range compared to the healthy group, whereas the CD3γ and FcεRIγ expression levels did not. In another case, the CD3γ expression level decreased from 10.57 to 0.82, the CD3δ expression level decreased from 3.95 to 0.63, the CD3ε expression level decreased from 19.14 to 2.23, the CD3ζ expression level decreased from 5.91 to 0.54, and the FcεRIγ expression level increased from 30.89 to 36.60 in the 4 months after treatment (Figure 2B). With the exception of the expression levels of CD3γ and CD3ζ, which remained out of the normal range, the expression levels of the other genes returned to normal. The relative gene expression levels of CD3γ, CD3δ, CD3ε, CD3ζ and FcεRIγ in the PBMCs from 2 patients after treatment. A significant negative correlation between the CD3ζ and FcεRIγ gene expression levels was found in the healthy group (r = -0.535, p = 0.049; Figure 3A), while there was no significant correlation between the expression levels of the genes in the AA group (r = 0.252, p = 0. 313; Figure 3B). The TCR has a short intracellular sequence that lacks signaling capacity, and the CD3 molecule contains immunoreceptor tyrosine-based activation motifs (ITAMs), which couple the TCR to the signal transduction mechanism. In mature T-lymphocytes, the TCR/CD3 complex can essentially trigger all adaptive immune responses [22, 23]. TCR signal transduction is mediated by the ITAMs. A total of 10 ITAMs are distributed in the TCR/CD3 complex in two distinct signaling modules termed the TCRζζ and CD3γε/δε [24, 25]. Although the TCRζζ ITAM plays a central role in TCR signal transmission, the CD3γε/δε ITAM module can provide normal TCR signal transmission in the absence of a TCRζζ ITAM motif . To gain more insight into TCR signal transduction, which is important for T cells activation, we analyzed the expression level of all four CD3 genes (i.e., CD3γ, CD3δ, CD3ε and CD3ζ) and the CD3ζ-related FcεRIγ gene in PBMCs from patients with AA. In contrast with recent studies that have revealed decreased CD3ζ chain protein and mRNA levels in most patients with AA, their results were derived from only five newly diagnosed patients with AA and patients (25 cases) in remission or relapse . In this study, we analyzed the expression pattern of all of the CD3 genes, and the data indicated that not only the CD3ζ, but also the CD3γ, CD3δ and CD3ε expression levels were significantly increased in comparison with those in the healthy group. The results suggested that there may be a different T cells signaling pathway activation disorder in AA. Like many other cell surface receptors, TCR/CD3 complexes are constitutively internalized and recycled back to cell surface. This downmodulation of TCR/CD3 at the cell surface prevents sustained signalling in T-APC conjugates and modulates the responsiveness of T cells to further antigenic stimulation . Up-regulation of CD3 gene expression in AA suggests that T cells may be in sustained signaling stimulation in the periphery that leads to inappropriate T cell activation. Unlike the CD3ζ chain, which mediates signaling through ZAP-70, FcεRIγ mediates signaling by associating with the phosphorylated protein kinase Syk [12, 29]. It has been reported that the Syk kinase is 100-fold more potent than Zap-70 , and it is preferentially recruited to the FcεRIγ . Krishnan et al. have found a physiological switch through which primary resting CD4+T cells transduce signals to the classical TCR/CD3ε/CD3ζ/Zap-70 complex, and effector CD4+T cells express and transduce signals through an alternate TCR signaling complex that excludes CD3ζ/Zap-70 and contains CD3ε, the FcεRIγ subunit and the proximal Syk kinase . It is interesting that this physiological switch in the TCR/CD3 signaling complex is not observed in CD8+ T cells . The TCR signaling alterations identified in our study suggest that the reduction in FcεRIγ expression in AA was unable to contribute to TCR signal transduction in a similar manner as the conserved functional ITAM motif. In this study, we first analyzed the FcεRIγ gene expression level and its correlation with CD3ζ gene expression in patients with AA; the FcεRIγ expression level was down-regulated and did not correlate with the CD3ζ expression level. These findings are in contrast to the immune status in SLE , where a lower CD3ζ expression is associated with a higher FcεRIγ expression level. These data suggest that the different dysregulated T cells activation pathways involved in AA may be more complicated, and AA is unlikely to be a typical autoimmune disease T cells disorder. We were unable to follow up with the clinical outcome of all the patients who were selected for this study. We monitored the change in the CD3γ, CD3δ, CD3ε, CD3ζ and FcεRIγ gene expression levels in 2 patients with AA who were in remission. All of the gene expression patterns changed relative to the normal level. These data suggest that the expression of these genes is disease status dependent. However, a limited number of patients (2 cases) were examined in this follow-up study; thus, this hypothesis should be confirmed in future studies with larger sample sizes. To our knowledge, this study is the first attempt to provide a gene expression profile of the CD3γ, δ, ε, and ζ chains and the related FcεRIγ gene in PBMCs from patients with AA. Taken together, the increased T cells activation, along with the abnormally immunological molecules may be an AA feature. Abnormal T cells activation in AA creates a cellular imbalance between immunity and tolerance, leading to immune system-mediated bone marrow failure. This study was sponsored by grants from the National Natural Science Foundation of China (No. 30972455), a China Postdoctoral Science Foundation funded project (No. 20070410840), the Natural Science Foundation of Guangdong province (No. 07301046), and the Fundamental Research Funds for the Central Universities (No. 2011610408). YQL contributed to concept development and study design. BL, SHC, LJY performed the laboratory studies. SCL, YZN, SF, XLW and YZ were responsible for collection of clinical data. YQL and BL coordinated the study and helped drafting the manuscript. All authors read and approved the final manuscript.